The Glass Recycling Company (TGRC) awarded the winning schools around South Africa for their ongoing glass recycling efforts during 2017. 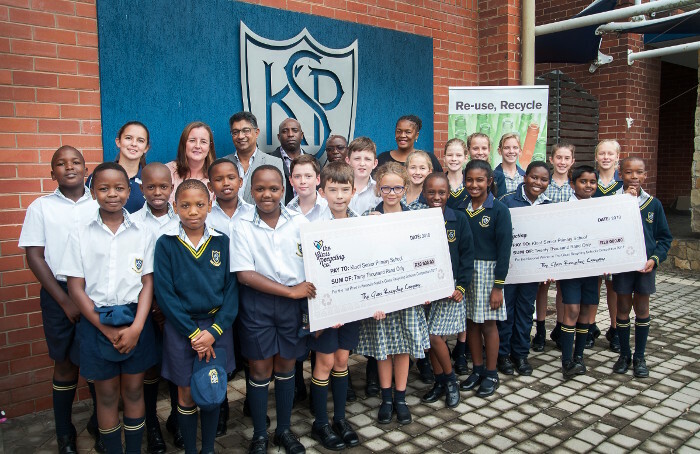 TGRC awarded Kloof Senior Primary School in Durban with a prize of R30 000 as the regional winner in TGRC’s Annual Schools Glass Recycling Competition. The school collected 72 324kgs of glass bottles and jars in 2017! In fact, the school won first prize in 2016 too! The winning schools in KwaZulu-Natal, Eastern Cape, Gauteng and Western Cape hosted prize-givings where the cheques were handed over to principals by TGRC CEO, Shabeer Jhetam. The three top-performing schools were selected in each region and received R30 000 (first prize for regional winner), R20 000 (regional runner-up) and R10 000 (regional third prize). The three top KwaZulu-Natal schools collected a total of approximately 93 603 kilograms of glass or 216 972 bottles and jars, with the three top Western Cape schools having collected a total of approximately 117 877 kilograms of glass or 353 631 bottles and jars. The three top Gauteng schools collected a total of approximately 63 361 kilograms of glass or 190 083 bottles and jars and the three top Port Elizabeth schools collected a total of approximately 26 817 kilograms of glass or 80 451 bottles and jars. “We want to encourage the youth of South Africa to look after the environment and make recycling a daily habit. Glass recycling requires so little effort from each of us and the impact it makes on the environment is vast. By running these competitions, we are hoping that learners, their parents, siblings and friends will make it a habit of recovering, reusing and recycling,” explains Jhetam. “The 2018 Annual Schools Competition has already kicked off, but, schools are still able to enter. The competition runs during the course of the year and will close on October, 31 2018. Schools can enter to win monthly cash prizes as well as the grand annual prize. We will be cheering all schools and hope they recycle even more glass bottles and jars than in 2017,” said Jhetam. The Glass Recycling Company (TGRC) consists of a team dedicated to increasing glass recycling in South Africa. We are passionate about ensuring every South African realises the value of recycling glass and actively embraces this practice.